Two-year-old boys are typically full of energy, imagination and curiosity. Playtime can be a great opportunity for your toddler to use up some of that energy constructively while also developing their motor and cognitive skills. 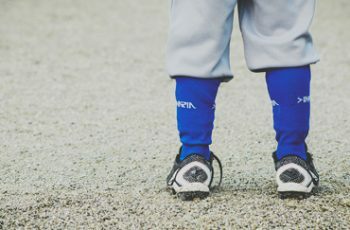 At two years of age, your little boy is in an intermediate stage. He is likely to find baby toys too simple to hold his attention, but he lacks the coordination and concentration to really enjoy toys designed for older kids. Each child masters skills at their own pace, so choosing toys that are appropriate to individual needs and interests is important. A two-year-old will typically enjoy toys that are simple enough for them to play with on their own but also provide a bit of a challenge for them to master. 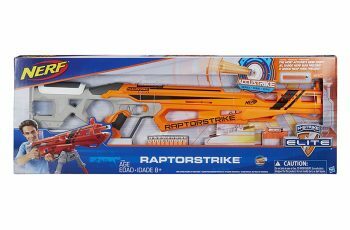 The following is a list of toys that have received high marks from parents for being fun and encouraging a two-year-old boy’s imagination and development at the same time. This child-sized ATV will not only be tons of fun for your two-year-old to ride but will also provide you with the adorable sight of your little guy cruising along. The Lil’ Quad is operated by buttons on the handlebars that are simple enough for a toddler to control independently, allowing your child to feel pride in doing it themselves. The Lil’ Quad moves at a child-friendly 2 mph even with a wide-open throttle. The ATV is low to the ground and is designed to be stable enough for a young child to climb on and off independently. The Lil’ Quad is battery powered and comes with a 6-volt battery and a charger. Thomas the Tank Engine has been a popular children’s character for many years, and now your little boy can take a ride around the Island of Sodor for himself. Thomas includes 18 feet of track for indoor play and can also be used off the track indoors or outside. Thomas reaches a maximum speed of 1 mph on the track and 2 mph off the track. Thomas is turned on and off by a button on the easy-to-use handlebar to make your two-year-old feel like a train driver all by himself. Thomas is powered by a 6-volt battery; the battery and a charger are both included. With an additional AA battery, Thomas says several phrases and makes fun train sounds. Small children are often fascinated with cars. Why not go the extra step and provide a fun way to transport those cars, too? The Green Toys Car Carrier five-piece set consists of three cars and a truck that detaches into a separate cab and trailer. The trailer features two functional ramps that your little boy can use to roll cars down to his heart’s content. This set is made in America from recycled plastic milk jugs and contains no metal pieces. The plastic used in this durable car carrier set is free of phthalates, BPA and PVC. The Drop & Go Dump Truck features bright colors and a sturdy design that holds up to boisterous toddler play. The truck includes a set of three play rocks, which your toddler can drop directly into the bucket or into a hole in the cab’s top. The cab counts each rock dropped in and then pushes it into the truck’s bucket. When the bucket is full, the rocks can be dumped by using the lever action or by lifting the hinged bucket. 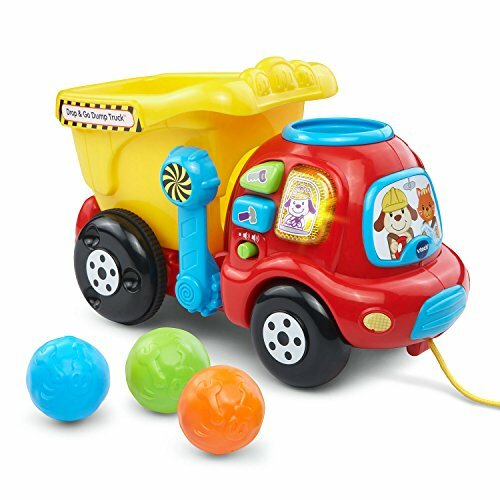 The truck also has an attached string to allow for use as a pull toy and has three fun buttons that play songs and phrases. The Drop & Go Dump Truck requires two AAA batteries, and demo batteries are included. Melissa & Doug has been producing imaginative toys from quality materials for more than 25 years. This wooden puzzle is a classic toy that can help children to develop their motor and matching skills. 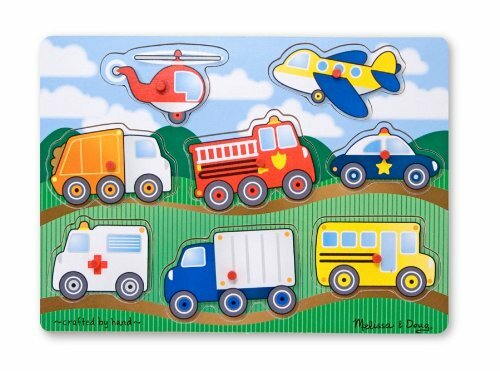 This eight-piece wooden peg puzzle features a variety of brightly-colored vehicles like a school bus, fire truck, police car and helicopter. Each slot contains a picture of the corresponding piece, helping your toddler avoid frustration as he builds his confidence placing pieces in the correct space all by himself. Grasping the pegs and fitting the pieces into their slots can also help your child to develop their fine motor skills and hand-eye coordination. This fishing playset does double duty as both a puzzle and a two-player game. The set consists of two magnetized fishing rods, a solid wood base in a vibrant blue and eleven tropical fish puzzle pieces. 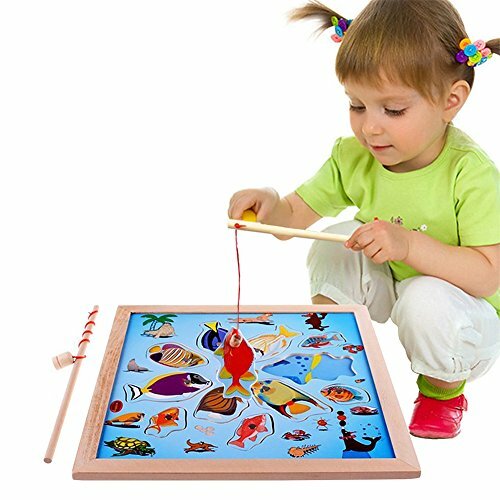 Tilt the base to dump the fish out and use as a traditional puzzle, or use the poles to play a fishing game. Each fish contains a magnetized dot that allows the players to use a fishing pole to catch them. 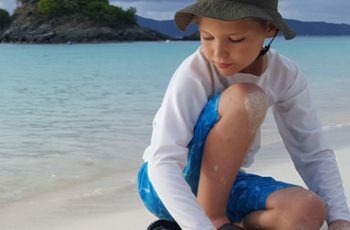 Catching the fish can be a great way for your little angler to develop their hand-eye coordination, and placing the fish back into their correct spots encourages problem-solving skills. The Fur-Real Roarin’ Tyler is not designed to just take up space on your little boy’s bed. 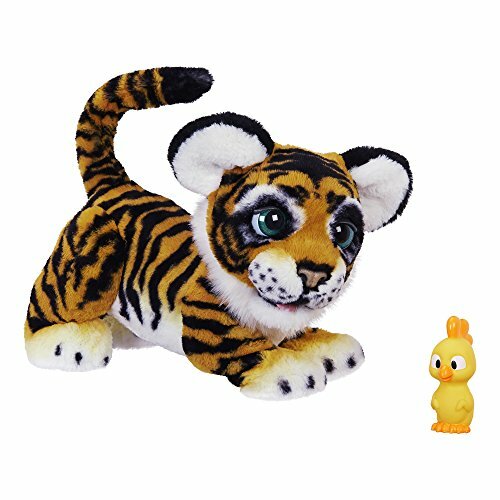 This playful stuffed tiger will interact with your toddler and respond appropriately when petted, talked to or presented with his included pet rubber duck toy. Tyler has a moving tail and facial features to create more than 100 programmed motions and sounds. When he hears your little boy roar at him, Tyler will give a playful crouch and roar in response. Tyler is equally adept at lower-tech playtime; his soft plush body and pose-able legs make him easy to snuggle with. Roarin’ Tyler requires four C batteries. Sports balls are a perennial favorite with the two-year-old set. 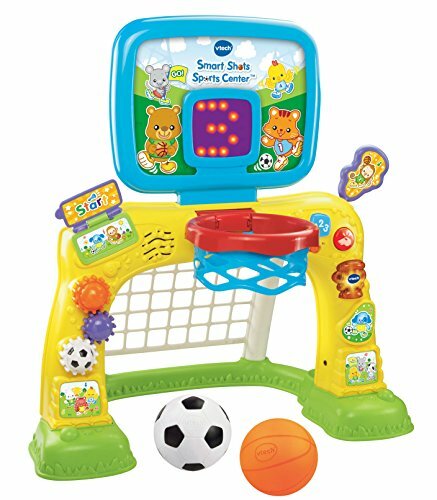 The Smart Shots Sports Center lets your little boy practice both his basketball shots and soccer goals in one toy. A toddler-sized basketball and soccer ball are both included in this set. The Sports Center has a soccer net on the bottom and a basketball hoop on the top that is low enough for a toddler to easily make a basket. A digital display records up to 10 baskets scored, and fun songs, sounds and phrases will make your little boy feel like he is the star player. Buttons, spinning gear wheels and a pull-down lever provide other fun ways to play and satisfy a young child’s need to touch and manipulate objects. The Smart Shots Sports Center runs on three AA batteries. A two-year-old boy may not have the balance and coordination required to ride a traditional bicycle right now, but the UltraLite Balance Bike is a great way to help him start learning those skills. 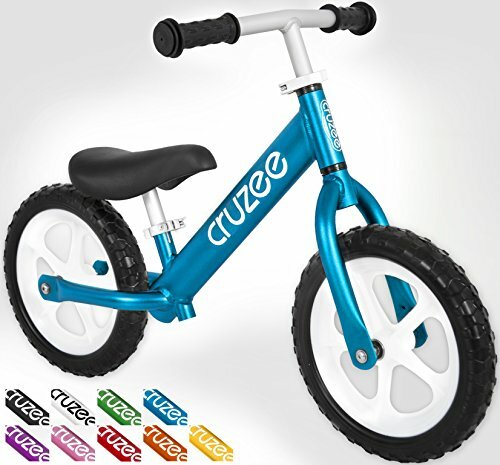 Designed with footrests but no pedals, the Balance Bike allows your little boy to push himself along with his feet and learn to balance his body without the use of training wheels. By helping a child learn balance before pedaling, transitioning to a traditional bicycle may be an easier process. This bike is truly ultra -light, weighing in at just over four pounds. The frame is made of rust-resistant aluminum and is available in a variety of bold, kid-friendly colors. The UltraLite Balance Bike has an adjustable seat and handlebars to grow with your child. Soft handle grips make it easy for your little guy to hold on and steer himself, and the tires are made of a heavy-duty composite that is difficult to puncture. The typical toddler has an abundance of energy, and jumping is a favorite way to release some of that extra pep. 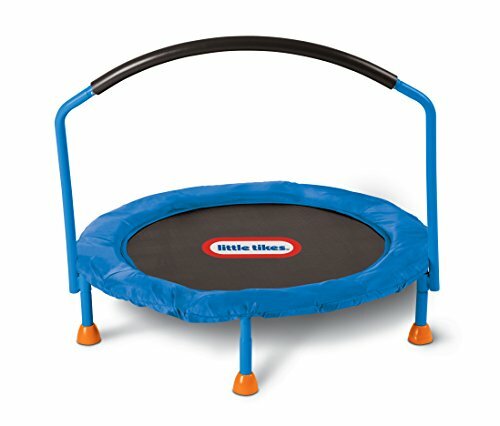 While many parents may have safety concerns about their two-year-old playing on a regular trampoline, the Little Tikes version is a great way to let your child enjoy jumping and bouncing safely. A handlebar spans the width of the trampoline to provide your little guy with a stable grip, and the springs are covered to help prevent little feet from finding their way in. At three feet across, this trampoline has a weight limit of 55 pounds and is intended to be used indoors by one child at a time. Many two-year-old children have a fear of darkness and find a night light to be a comforting addition to their room. The Twilight Constellation Turtle provides a gentle glow in a choice of three colors as it projects starry images onto your little boy’s ceiling and walls. Eight actual constellation settings are available to choose from, allowing you to help your toddler get an early start on learning astronomy. 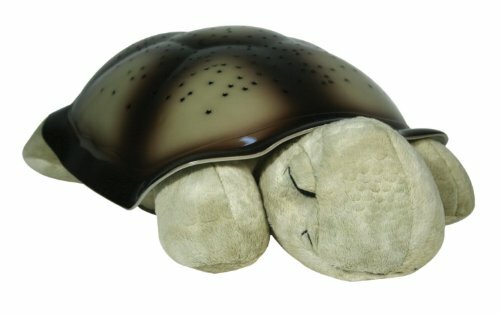 Physicians recommend total darkness for optimal sleep, and this turtle night light has a 45-minute timer to automatically turn the light off. The turtle has a cuddly plush head and limbs, and the projector is housed inside the hard plastic shell. The Twilight Constellation Turtle Night Light includes the required three AAA batteries.